Prices for detached houses and townhomes in Greater Vancouver slumped in October but remained steady in the Fraser Valley. Nov. 2, 2016 11:00 a.m. The B.C. government's new foreign buyers tax is affecting Lower Mainland real estate markets. Government actions such as B.C.’s new foreign buyers tax put more downward pressure on property prices in Greater Vancouver. The Real Estate Board of Greater Vancouver showed a 1.4 per cent decrease in the benchmark price of detached homes compared to October of last year, down to $1,545,800 from $1,567,500. Townhome prices in the GVRD also showed a slump – down to $669,200 from $676,300. Cheaper properties didn’t help shift houses either. New listings for detached, attached and apartment properties in Metro Vancouver totalled just 3,981 in October— a 17 per cent decrease compared to September when 4,799 properties were listed. “Changing market conditions compounded by a series of government interventions this year have put home buyers and sellers in a holding pattern,” said REBGV president Dan Morrison. The provincial government introduced a 15 per cent tax on property purchased by foreign buyers in Metro Vancouver on Aug. 2, in a bid to discourage investment by non-resident foreign nationals or corporations they control. However, real estate prices are still up compared to October last year. Detached homes are up 28.9 per cent in the REBGV area, which covers much of Metro Vancouver but excludes Surrey, White Rock, Langley and North Delta. Townhomes are up 25.7 per cent and apartments are up 20.5 per cent. The same slump wasn’t reported by the Fraser Valley Real Estate Board, which covers areas not subject to the foreign buyers tax such as Abbotsford and Mission, as well as parts of eastern Metro Vancouver where it does apply, such as Surrey. Detached homes showed a 0.7 per cent decrease in price from $878,100 to $872,100 but townhomes showed a 0.5 per cent increase (from $419,300 to $421,300) and apartment prices rose by 1.7 per cent (from $250,00 to $254,300) as well. Compared to last year, FVREB benchmark prices are up 34.3 per cent for detached homes and townhomes while it was up 25.2 per cent for apartments. 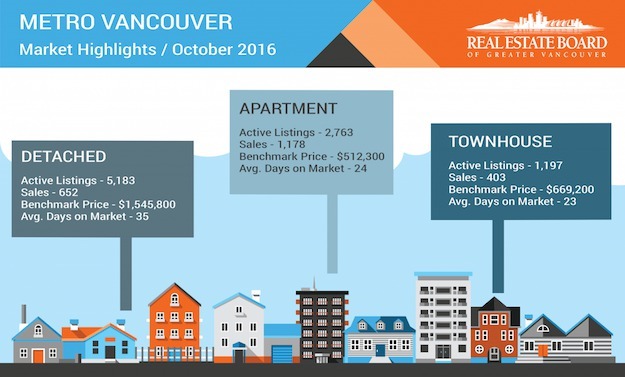 Sale numbers in the Fraser Valley peaked slightly above the 10 year historical average for October. “Sales activity was healthy in October, especially in the townhome and apartment categories. With prices beginning to level-off, it appears that buyers are becoming more motivated to explore the Valley’s available inventory,” said Fraser Valley Real Estate Board president Charles Wiebe.